Born in Perth, Western Australia to English parents, Tom spent most of his childhood in the suburb of Cottesloe finishing his secondary education in England. He spent 5 years in the British Army before returning home to Fremantle. He is passionate about the great outdoors, travelling annually to New Zealand to climb in the South Island and regularly runs guided trips in WA's Stirling Ranges. Tom is an accomplished adventure racer competing in many extreme multi-day events often without sleep that involve a variety of outdoor sports such as mountain biking, running/trekking, abseiling, climbing, and kayaking. When he's not pulling a sled, Tom divides his time between working as a personal trainer and preparing for his next expedition applying the lessons he has learned in almost two decades of pushing his limits. 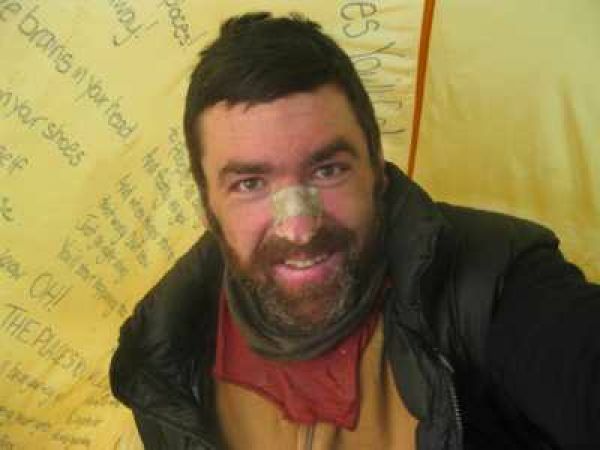 He set out on 1 March 2010 from McClintock Inlet at the northernmost edge of Canada with the aim of reaching the geographic North Pole, solo and unsupported. He describes the voyage as 'an epic battle by one man against blizzards, bears and broken ice, covering 800km in under 60 days on the ice'. From his blog : "By every measure that defines an outdoor challenge as epic–scenery, physical demand, and sense of accomplishment – this solo expedition to the North Pole qualifies." Buit six weeks later, on 16 April, Tim activated his emergency EPIRB device, almost forcing 2 Twin Otters and 1 helicopter from the canadian military base of Alert to go and rescue him on the field. His last position was 85° 51.111 N / 77° 06.585 W.